Ventilation is extremely important in a horse barn. Dust and ammonia odors can cause respiratory problems in horses, and a barn without sufficient airflow can become dank and unpleasant. Insufficient airflow can cause mold and mildew growth, which presents health problems for both horses and humans. Take care to consider whether or not your barn ‘breathes' enough - do stalls have windows as well as ground-floor ventilation? Are stall dividers solid, or do they allow air to circulate? A cupola on the roof of the barn will also help improve the ventilation. It may be tempting to heat your barn in the winter months, but horses are cold-weather creatures, and can become too warm in a heated barn. Insulating your barn should do the trick to keep it more comfortable than the outside temperature without making your horses hot. Horses are also extremely accident-prone! Take a good look at your barn with safety in mind, and note areas or objects that could cause injury. Features like narrow aisleways, low ceilings, small windows, and storage hooks at eye-level can all be hazardous. Stalls should be at least 10'x10', larger if possible, to prevent horses from getting cast while rolling. Safe flooring is also an important consideration. Concrete floors can be slippery, especially for horses with shoes. Cover concrete with rubber mats, or install rubber pavers for an attractive, safe floor. Dirt provides a very safe floor surface, but can be dusty! If possible, constructing a quarantine area in your barn can be immensely helpful if one or more horses become sick. While a separate structure is best, an area of the barn that can be cut off from other horses can help prevent the spread of disease. New horses coming in to your facility can also be housed in the quarantine area before moving in with the rest of the herd. Whether you are building a barn from the ground up or renovating an existing structure, safety and horse health are paramount concerns for PA horse property owners. Knowing that your barn is safe and healthy can provide you with the peace of mind to simply enjoy your horses without worry! Owning a PA horse property comes with a lot of maintenance concerns, among them being weed control in pastures. If you use your pastures as a main source of forage for your horses, it's important to control weeds as much as possible so that pastures are nearly weed-free. If your pastures serve more as a "dry lot" turnout area, weed control is not as important since the animals are receiving hay instead of grazing on grass. Fall is the perfect time to assess the weeds growing in your pasture, since they are at their tallest after a summer of growth and can be easily identified. Once you know what type of weeds are in your pasture, you can then formulate a plan to remove them. Don't know which plants to keep and which to get rid of? Contact your local branch of the Penn State Extension office to get help in identifying harmful weeds. PA horse property owners have several options when it comes to controlling weeds. The most basic way to prevent weeds from taking over your pasture is to maintain healthy grasses and legumes. If your pasture is planted thickly with quality forage, weeds have little space to grow. Frequent mowing can also greatly improve the health of your pasture by encouraging grasses to grow densely, and cutting down weeds before they have a chance to spread their seeds. However, if weeds have already taken over your pasture, an herbicide program may be warranted! Choose herbicides carefully, and understand when the best time is to use them. If weeds have already gone to seed, it's too late to use an herbicide! Broad-leaf weed killing chemicals will also eliminate beneficial legumes like clover, so be aware that you may be killing off desirable plants along with the weeds. Once again, the Penn State Extension office can be of immense help in formulating an herbicide plan for your pastures, identifying weeds, and understanding the best way to reduce weeds in your area of Pennsylvania. The Devon horse show grounds in Chester County, PA is one of the most prestigious locations for equestrian competition on the East Coast, hosting the historic Devon Horse Show & Country Fair in the spring, and Dressage at Devon in the fall. It's almost time for this year's DAD festivities, and it's a can't-miss event for dressage enthusiasts in PA! In addition to the competition classes normally held at the show, this year's competition will showcase special performances by the famous Lipizzaner Stallions, and exhibitions will be held during breaks between regular competition classes. Even "non horsey" friends and family are sure to enjoy these performing white stallions! Also new for 2015 is the "Dressage With the Experts" program. Spectators will have the opportunity to purchase a special audio headset that will allow them to listen in on expert commentary during the show. Being able to hear the input of top riders, trainers, and judges will be an unprecedented educational opportunity for those that choose to participate in the program. As in years past, this year's Dressage at Devon will include both performance and breed competitions, offering ridden and in hand classes for dressage horses of all ages and levels. Foals destined to be future stars will be shown in the same ring as current Grand Prix veterans, providing a unique opportunity to see both the present and future of the sport. There will also be top-notch shopping and dining - it wouldn't be Devon without it! Spectators can take a stroll through the vendor village and shop for everything from clothes to tack to home décor, and enjoy what has been voted the "Best Food On The Show Circuit". A trip to Devon certainly isn't complete without a big, hot plate of Devon Fries! Dressage at Devon begins next month, and will run from September 29, 2015 until October 4, 2015. To purchase tickets, find schedule information, or apply to be a volunteer, visit the show website: www.dressageatdevon.org. 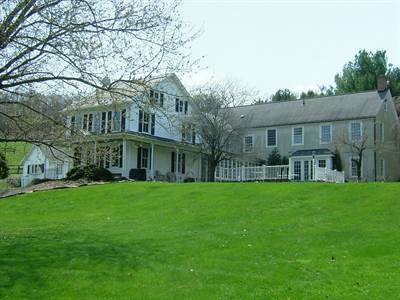 New Tripoli, Weisenberg - Announcing a price reduction on Golden Key Road, a 3,724 sq. ft., 4 bath, 7 bdrm 2 story. Now $485,000 - MOTIVATED SELLER. $750,000, 3Bd/2.5Ba Single Family House, 3187 sqft. Spectacular equestrian estate privately situated yet convenient to Rt. 33. Tremendous views to Harmony NJ. Professional & luscious landscaping w/ an abundance of perennials, exotic vines & wildflowers. Bridle & footpaths carved throughout property will enthrall nature lovers & horseback riders. Fantastic 44x72 barn houses 6 stalls (3 12x12 & 3 10x10) wash stall, charming tack roomcomplemented by slate mantel w/ electric fireplace & handy built-in toilet. 6 inch insulated walls in garage/workshop in other half of barn. Car/tractor buffs will love this spacious work area. 2 large pastures, 2 paddocks. Wood fencing & Electrobraid. Custom home w/ large kitchen, upgraded cabinets & center island. Sliders lead to multi-level deck which captures sweeping vistas & overlooks fascinating pergola covered by Kiwis & Wisteria. Impressive entry & family rm have cathedral ceilings. Formal dining rm, parlor & office compete the 1st level. Romantic master suite w/ sitting room, large WIC & Jacuzzi tub. Study could be used as guest bedroom. Basement is plumbed for bath, shower & toilet & prepped for radon system if desired. Large area w/ radiators perfect for arts & crafts. Central vac, poured concrete foundation. Lightning rods on house & barn. Welcome To The Team, Petrina! 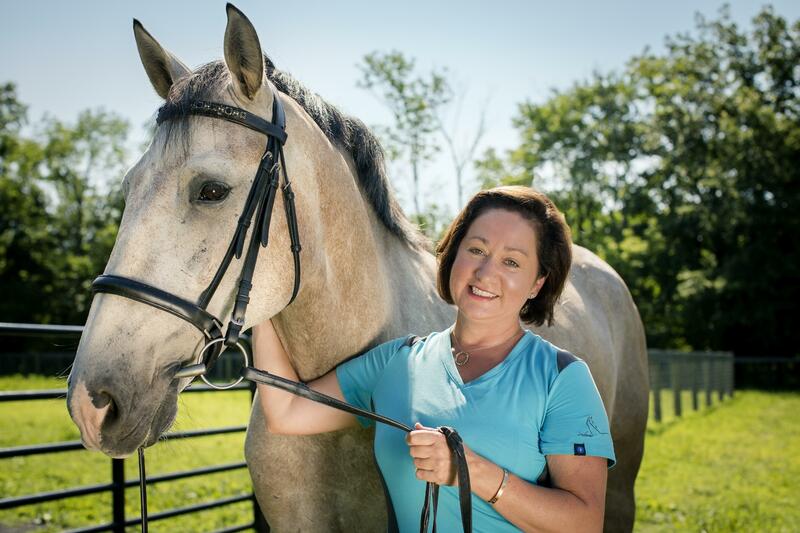 When it comes to buying PA horse properties, what you see is not always what you get. Especially in rural areas, it's common for landowners to put their properties into conservation easements or preservation programs. But what does this mean for you as a buyer? It means that before making an offer, you and your real estate agent need to do some careful research to make sure that the property in question is suitable for what you want to do, whether it's building a home, raising horses, farming crops, or expanding your equestrian business. One of the first things you should do when you find a PA horse farm that interests you is to get in touch with the township zoning office. The zoning code will determine what uses and activities are permitted on the property. Even if a property is located in a rural or ‘horsey' area, you may not be able to keep horses there! Many townships also have restrictions on the number of animals that can be kept per acre of land. If you plan on having horses or other livestock, this is essential information! Another vital piece of information that you should read carefully before making an offer is the property deed. You can get a copy of the deed from the county courthouse for a small fee, if the listing agent cannot provide one for you. In the deed you might find that the property has a shared driveway, utility easement, or right-of-way. Things like these can affect your use of the land, and you should take careful note of them. Conservation easements are also very common in Eastern PA, and are used to prevent the over-development of our rural communities. These easements restrict the use of open space, and usually include building restrictions. Many times, a conservation easement will specify that buildings can only be located in a small area of the parcel, known as a "building envelope". Certain areas of the land may not allow any type of building or development, and landowners may even be restricted from cutting down trees depending on the severity of the easement. Some parcels may be used for pasture, but not for riding arenas. If the PA horse farm you're interested in purchasing is in a conservation easement, it's important to read over the easement very carefully and discuss it with your real estate agent. Before making an offer on a PA horse property, be sure to do your research! Zoning, Deed Restrictions, and Conservation Easements can all play a very important role in the suitability of a particular parcel. Contact a sales associate at Cindy Stys Equestrian & Country Properties, Ltd. to get help in your home-buying process. The Equi-librium Therapeutic Horsemanship Program in Nazareth, PA is a wonderful discovery. As a volunteer you can go there as just a horse person, or someone looking to help people with special needs. Either way, working with these special people, or the horses, will enrich your life forever. As a potential volunteer, the program begins with a three hour training orientation. The orientation begins with a talk and a video explaining a program that brings together people with special needs, and horses. When you go, plan to learn many new things about physiology and psychology of the human. The new volunteer will be exposed to the understanding of what horses have to offer people with special needs. Volunteers will gain knowledge of how people with cognitive, physical or emotional needs can benefit from equine assisted horse activities. The horse's movements provide sensory stimulation to the body and brain of the rider, and the horse's movements affect many different muscle groups. For example, the pelvic movement of the horse reproduces the proper motion of the human pelvis at the walk. For people who are unable to walk, the horse provides the movement for them, and helps the brain recreate that movement while riding the horse. Horseback riding can help improve gross and fine motor skills, and stimulate the cardiovascular system. On an emotional level, the act of riding a horse can build self-esteem. When a person is compromised physically, yet can control a 1,000 lb. horse, that person can feel very powerful. Feeling powerful is very encouraging for someone who has very little control in their physical life. The training and experience is very moving. The new volunteer may be moved emotionally when confronted by the realities of the limitations of some people's physical selves. You will see how beneficial this program is for motivating and stimulating the emotional and physical growth for people with special needs. Equi-Librium offers so much for the families and caregivers of the people in this program . Not only does the program add depth of movement and freedom but gives these individuals a chance to do something that requires control, strength and athleticism. As for volunteers, it brings together an ability to enjoy horses, and people, improving lives as one. Please come out and volunteer! For more information, visit the website: www.equi-librium.org. . . . . as you are driving down the road, you see a Dollar General Store, but instead of cars zipping in and out of the parking lot, you see horse drawn buggies. These horse drawn buggies are owned by the Amish. They are a common sight to see in Southeastern Pennsylvania. The Amish use horsepower differently than we do. Horses instead of engines are used to pull their buggies, wagons and equipment to help the farming and much of the heavy work around the farm. The Amish greatly rely on their horses. Pennsylvania Dutch is widely spoken in this part of Pennsylvania by the Amish. . . . . you see gorgeous scenery and mountains driving through the Northeastern part of Pennsylvania. Northeastern Pennsylvania is known for the famous Pocono Mountains with its many resorts, campgrounds, gorgeous waterfalls and hiking trails, such as the Appalachian trail. It is a great area for vacationers to spend time relaxing in the country, enjoying nature and the simple life. For those of us that enjoy the outdoors with our equine friends, many horseback riding trails can also be found throughout. The Poconos also have great areas for those that enjoy winter sports such as skiing, snowboarding, snow tubing, even horseback riding on trails in the snow. . . . . you see open fields, some planted, some fenced with cows or horses grazing, others with various farm animals. 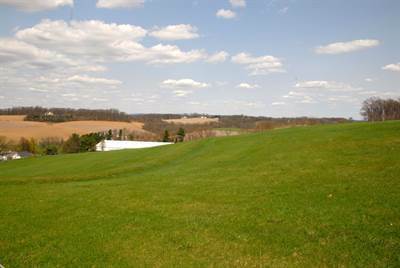 Portions of Eastern Pennsylvania have some beautiful farmland and countryside. Parts of Pennsylvania are known for some of its historic barns. Some of these barns have been around since the 1800's, some even as early as the mid 1700's. A few of the barns will have hex signs painted on the sides, which the Pennsylvania Dutch are well known for. Each hex sign has a particular meaning. . . . . historic stone or log homes can be found throughout. Many areas of Eastern Pennsylvania have historic stone or log homes, some dating back to the 1700's. Some are large, elegant homes, while others are small homes, with each one having that certain charm and homey feeling about them. . . . . numerous trucks hooked up to horse trailers can be seen parked at various locations. Eastern Pennsylvania has many places and activities that are geared towards the equestrians. The Devon Fairgrounds, Farm Show Complex in Harrisburg, Bucks County Horse Park, numerous areas with horseback riding trails, and many other venues that hold horse shows, clinics, etc.
. . . a game of polo played on an open field. Tinicum Park in Bucks County has a polo club. Every weekend during the summer months, the public is welcome to stop in and see a game of polo. It is quite an experience if you haven't seen a game played before. The next time you see any of these things, you can be sure that you are in Eastern Pennsylvania. History was made on June 6, 2015 when American Pharoah won the Belmont Stakes to become the first horse to win the Triple Crown in 37 years. Having bested his competitors in the Kentucky Derby and the Preakness, the racing world held its breath to see if the impressive Thoroughbred could do it once again and clinch a Triple Crown victory. There have only been 12 Triple Crown winners, including American Pharoah, in all of American Thoroughbred racing history. It is one of the most difficult feats for a racehorse to accomplish, and over the years many have come close only to be beaten at Belmont, the final race in the series. The last Triple Crown champion was Affirmed, who won all three races in 1978. Since then no horse has been good enough to capture the title until American Pharoah, owned by Ahmed Zayat, stepped on the scene this year. Jockey Victor Espinoza had ridden two near-champions for Baffert in years past, and was confident that this weekend was his time to shine aboard American Pharoah. Espinoza and Pharaoh took an easy lead right out of the gate, and kept their position at the front of the pack for the entire race. Other horses came close, but none could quite catch him. After cruising through the final turn. American Pharoah kicked into gear and his stride opened up. The rest of the pack was left in the dust and American Pharoah easily won the Belmont by 5 lengths, the crowd erupting in a deafening roar as the first Triple Crown winner in 37 years blasted across the finish line at the Belmont Stakes. Congratulations to American Pharoah and all of his connections! A Triple Crown Winner has been a long time coming! Manure management is the most important part of controlling flies. Flies lay their eggs in moist manure, so removing manure and storing or spreading it far from the barn is the first step in keeping flies at bay. Spreading manure immediately so that it dries in the sun, or composting it so that it becomes unsuitable for fly larvae are two effective techniques that prevent flies from breeding in the first place. Mosquitoes, however, choose standing water as their medium of choice for laying eggs. Be sure to remove any standing water from your property and address leaks or clogged drains quickly to avoid creating a breeding ground for mosquitoes. Of course, there is no way to prevent ALL flies and biting insects from breeding on or traveling to your property, so they must be dealt with! There are several effective fly traps on the market that attract flies to a bag or jug filled with water, where they then drown. While these traps can be stinky and will need to be replaced several times a season, they are effective and safe. Avoid fly paper or sticky traps that use adhesive to capture flies - while they do catch and kill flies, non-target wildlife such as birds, bats, bees, and butterflies can also be killed when they get trapped in the adhesive. Feed-through fly control is becoming more and more popular as dietary supplements for horses become more commonplace. These supplements can make your horses' manure unattractive to flies, or give their skin an unpleasant aroma that discourages flies from landing on them. Lastly, there are fly repellant sprays and physical barriers that you can use to protect your horses from biting insects. With so many fly sprays on the market, it's important to try several until you find one that works for your horse and location, and re-apply after your horse has sweated heavily or gotten a bath. Fly sheets and fly masks provide a layer of protection against fly bites, and can go a long way to keep horses happy and comfortable when out in the pasture. Inside the barn, fans can discourage insects from landing and help keep the stable a fly-free zone. Whatever method you choose, keep flies under control to have a happy, comfortable summer on your PA horse farm! This little guy, born this spring at Dana Point Farm, is practicing to be America's next great Thoroughbred racehorse. The bay colt, known as Spencer around the barn, is a son of the great racing stallion Wiseman's Ferry, sire if two-time Breeder's Cup winner Wise Dan. Spencer certainly has the bloodlines to be a winner, and will carry on the legacy of his sire. If you are looking for the perfect place to breed and raise horses, consider the beautiful Dana Point Farm in Lenhartsville, PA. Currently listed at $1,150,000, this 60-acre piece of paradise is the ideal location for any equine business. Contact Cindy Stys today for more information. This stunning 50-Acre Equestrian Center is ready and waiting to be an active facility once again! Once a bustling show barn, this 68-stall horse farm is the ideal setting for the professional equestrian looking to move or expand their business. With most of the acreage fenced for pasture, Blue Gate Farm can easily support dozens of equines. The main barn holds 47 stalls in two aisles, and skylights throughout the building make the barn exceptionally bright and airy. 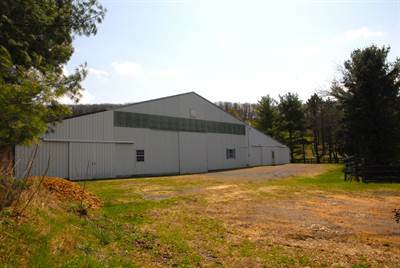 The attached indoor arena measures 60'x190' and is flanked by two viewing rooms. 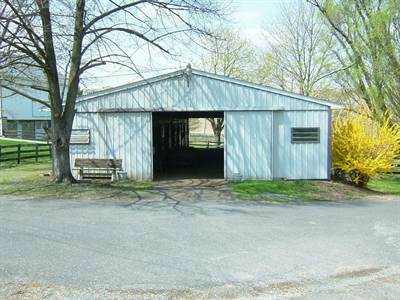 The main barn also includes 5 tack rooms, office, rest room, wash stall, grooming stalls, and hay loft. As if those amenities weren't already enough, Blue Gate Farm also features a smaller 12-stall barn with tack room and wash stall, a 9-stall bank barn, and a large run-in shed in one of the expansive pastures. Overlooking the pastures is a massive outdoor arena large enough for even the biggest jumper courses or carriage driving. The 4-bedroom 4-bathroom main farmhouse looks out over the barns and pastures, and the newer addition has been carefully designed to reflect the charm of the historic portion of the home. Custom built-in cabinetry can be found throughout the home, and the gourmet kitchen features beamed ceilings specially built to appear antique. 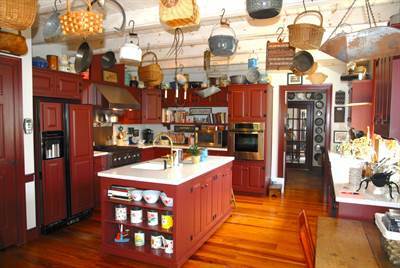 Cooks will love the ample counter space, 6-burner gas stove, and deep farmhouse sink. The large family room is accented with a fireplace and beautiful glass doors that lead to the deck surrounded by gardens. A sunroom along the other side of the deck provides a peaceful place to sit and enjoy the view. Upstairs you'll find a master suite with dressing room and spacious walk-in closets, as well as three other bedrooms and a large office with built-in cabinets and walk-up access to the attic. Downstairs in the historic side of the home are a formal dining room, library and parlor. If the spacious farmhouse doesn't provide enough room, the lovely 1-bedroom carriage house and detached studio apartment supply additional living space. Blue Gate Farm is the ideal location for professional equestrians of any discipline, horse-loving families, or anyone who desires to own a property with plenty of acreage and outbuildings. 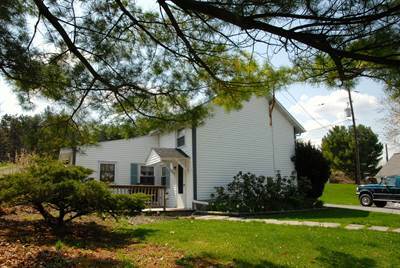 Durham Township, Kintnersville - Announcing a price reduction on 5065 Lehnenberg Rd, a 1 bath, 1 bdrm single story. Now $221,000 - 15% Price Reduction!. Eastern Pennsylvania is the ideal place to breed and race Thoroughbred horses. This is thanks in part to the Pennsylvania Horse Breeders Association (PHBA) which offers fantastic incentives for owners and breeders of Thoroughbred racehorses in Pennsylvania. Last year $33 million was paid to PA-bred horses through the PHBA, making it one of the most lucrative incentive programs on the East Coast. In support of breeders, the PHBA will reward the breeders of any PA-bred horse that finishes 1st, 2nd, or 3rd in any Pennsylvania race in 2015. Owners of these horses will also receive a bonus - in fact in 2014, $6 million was paid in owner bonuses alone! The PHBA will also run 500 PA-bred stakes races in the upcoming year, affording local horses, trainers, and owners even more opportunities to earn bonuses. Horses that were also sired by Pennsylvania stallions will receive additional bonuses. Pennsylvania racetracks offer 500 race days per year at 3 different tracks, which equals more opportunities to compete and win for PA trainers, breeders, and owners. The sheer number of races offered in PA far outshine any other northeastern state! To take advantage of this incredible program, all you have to do is register your Pennsylvania-bred Jockey Club registered Thoroughbreds with the PHBA. PA-bred horses have an earnings potential far and beyond that of horses bred in other states, owners and breeders of winning horses in Pennsylvania, and there is no cap on the awards that can be earned through the PHBA. If you're breeding, training, and racing Thoroughbred horses in the Mid-Atlantic, Pennsylvania is the clear winner when it comes to finding the best place to run your horse racing business. To learn more about the PHBA and all of the ways you can earn money breeding and racing horses in Pennsylvania, be sure to watch the video attached to this post.